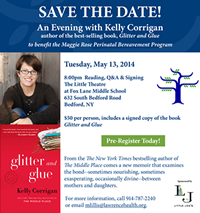 An Evening with Kelly Corrigan, author of the best-selling book, Glitter and Glue to benefit the Maggie Rose Perinatal Bereavement Program. Tuesday, May 13, 2014. 8pm: Reading, Q&A & Signing. The Little Theatre at Fox Lane Middle School, 632 South Bedford Road, Bedford. $50 per person, includes a signed copy of the book Glitter and Glue. From the New York Times bestselling author of The Middle Place comes a new memoir that examines the bond — sometimes nourishing, sometimes exasperating, occasionally divine — between mothers and daughters. For more information, call 914-787-2240 or email mlillis@lawrencehealth.org. Click here for tickets.